Alcatraz. The name creates images that are universal: prison, hopelessness, loneliness, horror. But now, thanks to a work related volunteer activity, the “rock” has a new meaning for me. 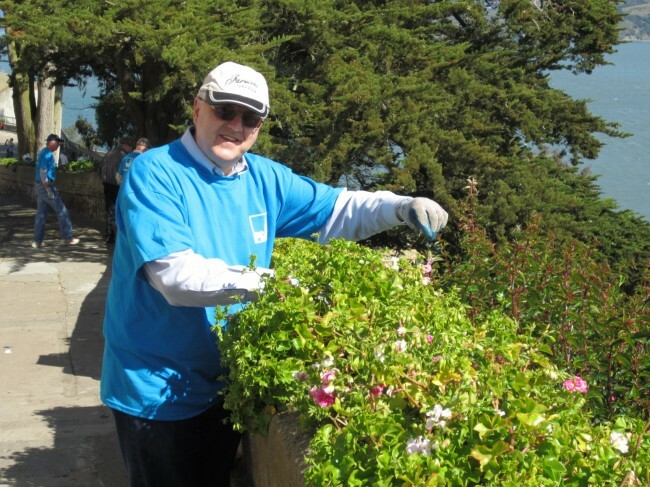 My coworkers in San Francisco and in the Central Valley participated in an environmental work volunteer project sponsored by the National Parks Service at Alcatraz on May 22. We were part of a gardening restoration project that has been going on since 2003 as crews work to reestablish the historic gardens. Every year, our work group chooses a site to do a volunteer project. We get away from the office to do something that is helping the environment, while at the same time we get to know one another a little bit better. Management gurus might call this team building, but I don’t think that term does my work group justice. Our team is already built. What we have is care and consideration for one another. Our day started at Pier 33 in San Francisco. Armed with water bottles, sunscreen, layered clothing, and a desire to get down to work, we boarded the transport boat to the island shortly before nine AM. We arrived on the island about fifteen minutes later for instructions from our National Parks volunteer Sheila. For the next three hours under Sheila’s direction, we pulled weeds, trimmed dead flower stems, shoveled compost, applied week killer, and watered plants. We then headed to lunch provided to us from two additional members of our team. 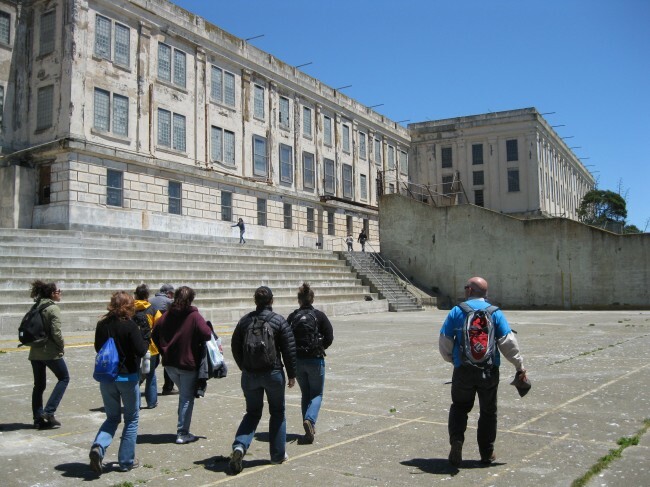 After lunch, another volunteer (named Greg) led us on a special guided tour of the former prison yard. Greg took us all over the prison area. We saw graffiti tagged buildings from the Native American occupation in the late 1960s. We saw the laundry room where prisoners could get a spectacular view of the Golden Gate Bridge and learned that time working in the prison laundry was considered a benefit inmates earned as it meant relief from the very small prison cells. We also saw the spot where the first attempted escape from Alcatraz took place. The prisoner died trying; he was shot by prison guards. We then passed the outdoor exercise yard, where the prisoners got their daily dose of fresh air. Inside the prison, we saw the infirmary, mental ward, chapel, and library. We also saw the cells and witnessed the closing and opening of individual cell doors. That clanging of the doors in unison sounded just like it sounds in the movies. Speaking of movies, we saw sections of the prison used as background scenery in The Rock. We had a great day at Alcatraz. As we were wrapping up our tour, we passed by our environmental work site on the way out of the prison yard. I felt a strong sense of accomplishment that I’m sure my coworkers felt as we left the island. Alcatraz still carries a lot of negative images for many people. But thanks to the efforts of the National Parks Service, and my company’s encouragement of volunteering, I can now add the words: beauty, serenity, and camaraderie to the list of adjectives that describe this small island in the San Francisco Bay.